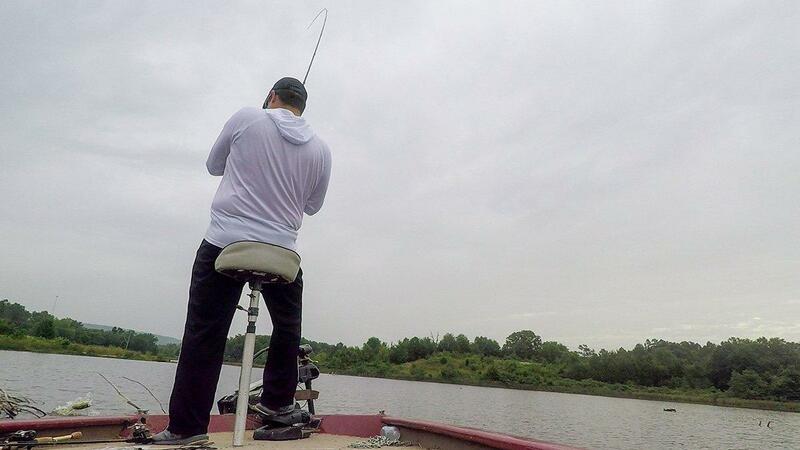 Fishing a new lake can either be a daunting or exciting endeavor. For me, it’s always the latter because I love the part of fishing that is exploring new places and figuring out the fish in that section or body of water. But I will admit, it took years of learning to read water and choosing the best lures for the conditions at each new place. 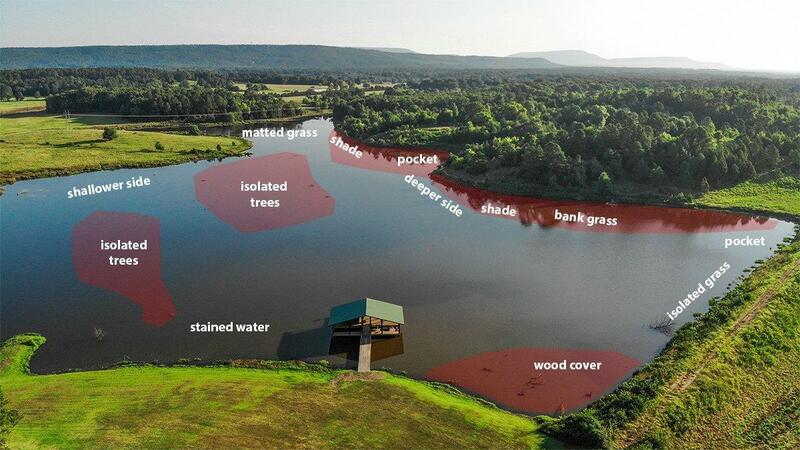 I recently fished a new lake on a trip to another state and wanted to share the process of how to assess a new lake, choose the best lures to cover the water, target shade, then adapt to the fish and revisit productive areas to maximize your time on a fun new fishery. The first step is always figuring out what you are faced with on any given fishery. Generally, I will look at things like water color, clarity, available cover, slope of the banks around the water, shaded areas, feeder creeks, and signs of forage or activity on the water. On this particular body of water that we’ll call Hill Lake for the purposes of this article, I noticed there was some laydowns and wood stumps around the boat launch and a dock. I also noticed there was a lot of shoreline grass that came a foot or two off the bank and then some isolated standing timber dispersed throughout the lake. I also noticed there was a high bank on the east side of the lake that would provide a shaded area for most of the morning and probably the deeper water as compared to the other flatter side. I decided to fish through the first pocket with wood and grass to see if I could assess which the bass might prefer or if either were productive near the shore. One thing to note, this can also be the best way to learn to break down large bodies of water. Pick a large bay and treat that creek arm like it’s own small lake. Look at options shallow and deep, assess cover and water quality and then cover water to figure out what zones the fish seem to frequent the most. Then try to cover as much of the productive areas as you can with the right bait and presentation. First thing I noticed on this new lake was moss along the bank. That immediately ruled out lures like spinnerbaits, crankbaits and others that would scoop the bottom and pickup a lot of gunk on every retrieve. Because the area was shaded and there was shallow cover to put a bass in skinny water, I started with a topwater toad, in this instance the Zoom Frog. 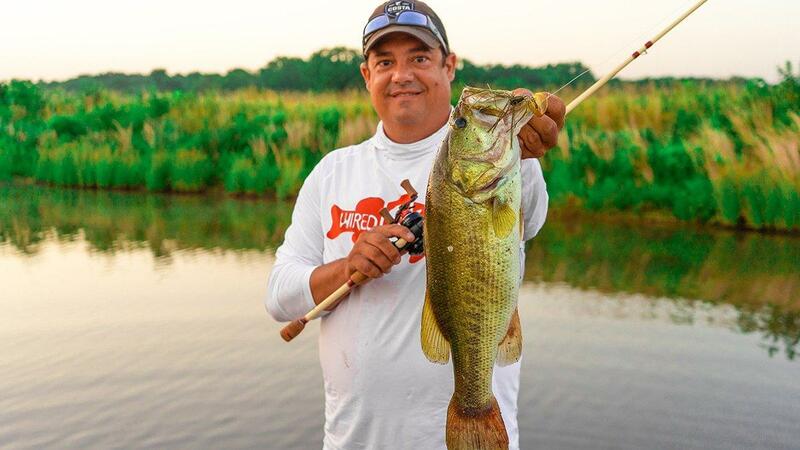 Because a toad is usually fished weightless on a Texas-rigged EWG hook, it will come over and through cover easily, and a toad is a very overlooked but highly productive lure for covering water fast. The Zoom Frog puts out a good gurgle noise and commotion and will often give you a read on how aggressive the fish are. We didn’t make it 20 yards and had two nice 4-pound bass off of shallow wood. This is a clue to fish a little faster. We ripped down the first bank and pocket fast but only had one other bite around grass. So we rigged up some Texas-rigged Yum Christie Craws to pitch to isolated cover and bank grass as we went along. The craws got a few more bites on the next shaded stretch, however the quality was not as good. This is where having two guys fishing on a new lake is beneficial. I stuck with the Zoom Frog and my brother-in-law, John, threw the Texas rig behind me. After hitting the first pocket with cover, we focused on the shaded side of the lake after seeing better quality activity on topwater, and with shade, fish up in the very shallow cover are usually not as spooky. The hunch was right, and we started boating bass a lot faster. It helps to make really long casts but to position the boat where your bait is in the shade zone longer. We figured out most of the bites happened in the first 3 feet from the bank. So I put the boat in closer and threw more parallel to the grass, while John pitched to isolated clumps and cover. If we came to a cut or pocket, we cut across out wide and fished around looking for isolated wood cover that is often found in those type places. It was an educated prediction that paid off as we found more bass scattered in the shallow cuts. The shade gives you a zone that allows you to fish really fast. Instead of backing way off the bank and making perpendicular casts where your bait is in the strike zone only about half the time, you can get even with the shade line and fish more parallel or at 45-degree angles and stay in the most productive zone the whole time. Position allows you to fish fast and cover the most water, which is what you want to do on an unfamiliar lake. We fished one whole side of the lake in short order, and had a pretty good read on the bass and their activity level. We cut across to the other side that was more in the sun, shallower but had some matted grass and sparse pieces of wood out off the bank. We had some huge blow ups on the shallow matted grass but figured out that flipping the isolated wood with the craws yielded more consistent bites. We also had a lot more misses on the Zoom Frog. Some huge fish washed all over the Frog but never got it. Several smaller fish would miss it or get hooked for a second and come off. We had caught a bunch of bass already on the Frog. So I switched up to a swim jig and a vibrating jig thinking maybe the fish wanted it just under the surface. That change improved the fishing once again. Immediately the number of bites went up and the quality of the fish went up. I was fishing a Strike King Skipping Jig with a bluegill colored Yum Pulse Swimbait and blazing the fish with it. I caught a few on the new Terminator Shudder Bait bladed jig. We would also pick up the Zoom Toad and a Booyah Toad Runner and managed a few nice keepers on them as well. But that swim jig could be fished faster and I would fish it through the grass, reel up real fast and fish the next stretch of grass. I was getting twice as many retrieves and catching twice as many fish. Refining the presentation often will double your output on fish catches. We ran the shade stretch with the swim jig and frogs again and caught a bunch more fish. We also hit a line of standing trees out in the middle of the lake and caught a bunch of nice bass flipping Texas-rigged plastics like the Christie Craw and a Netbait Paca Craw. Continually improving your approach, things like adding rattles and hopping a Texas rig in a productive piece of cover repeatedly can often be the subtle adjustment that yields way more bites. That was the case for us. So by reading the water initially and figuring out a few baits that work in those conditions, you can cover it quickly with one lure and gauge the mood and activity level of the fish as well as their more prominent locations, and then refine your presentations from there. You might have to go a touch shallower or deeper. You might have to work a lure more aggressively or be real stealthy with your casts to get into really shallow water. You might find that a lure just below the surface is a bit more effective than on top. 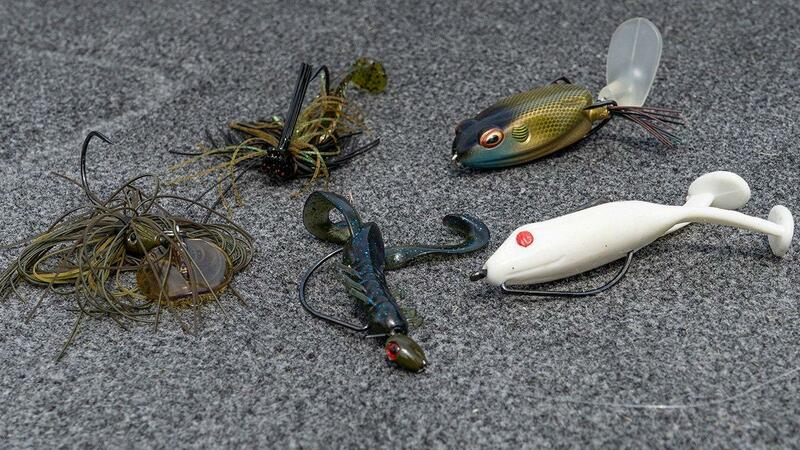 You can learn a lot about the lake by covering water with something like a toad, a buzzbait, a swim jig or spinnerbait. And work specific targets a little more methodically. 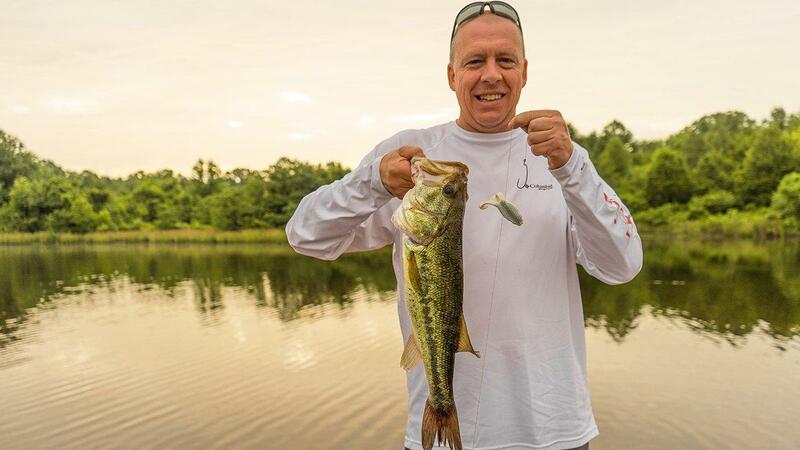 Speed and depth can be critical for shallow bass. 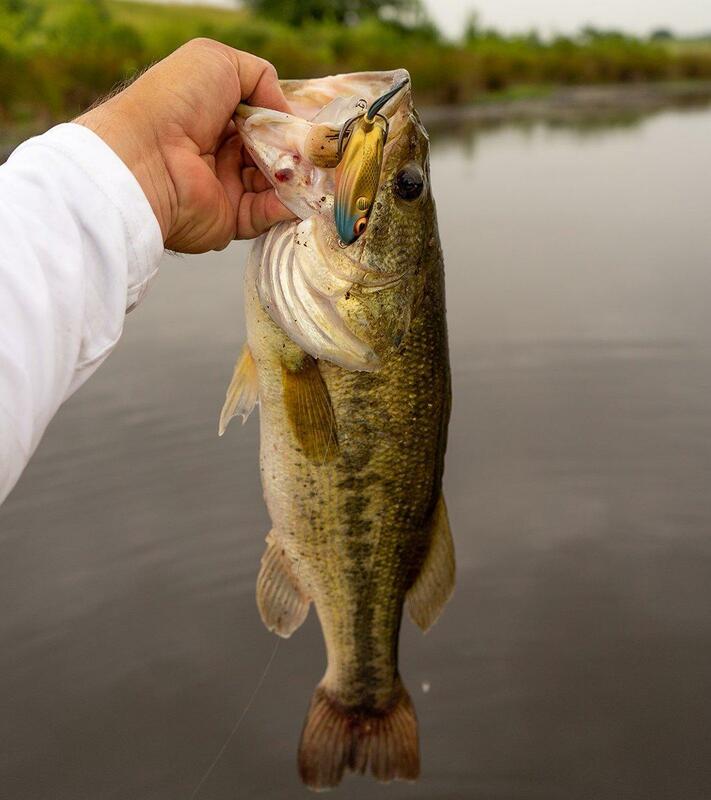 Often the faster you work a bait, the more bites you get which is perfect because you can cover so much more water and get so many more opportunities. The cover was only in the first few feet of water along the bank on this lake and most of the fish were between the cover and land. Little discoveries like that make for a lot more catches. So assess all the factors and then revisit the better areas with a refined approach to catch a lot more fish on a new lake or river. And then you can apply these same basic principals to break down waters for tournaments or on a short vacation where time is critical and you’re trying to maximize fishing and catching.